SHAWNEE — About three years ago, Kathy Dorman went to a funeral at her parish. After the committal rites at the cemetery, she and the other mourners returned to the parish for lunch. What she found was impressive — and moving. Members of the St. Joseph Parish funeral dinner ministry had prepared and served a wonderful lunch. She decided to join the ministry. On July 11, 2016, her father, Martin Wayne Regan, died, and she briefly switched roles — from giving to receiving the care. Only then did she fully appreciate the value of this bereavement ministry. Funerals are not only — or even primarily — about the dead. As the bereavement (or funeral) ministry at St. Joseph Parish demonstrates, funerals are really about taking care of the living. The first part is, of course, the funeral and burial liturgies, which are the responsibility of the parish clerics: pastor Father Michael Hawken, associate pastor Father Daniel Stover and Deacon Tom Mulvenon. But beyond the sacramental and liturgical aspects, there are three more ministries: the card ministry, called Grace-Filled Greetings; the funeral- exclusive Resurrection Choir; and the funeral dinner ministry. The spirit of hospitality and welcome people are met with at St. Joseph, and an emphasis on the promise of the resurrection during the liturgies, can impact people tremendously, he said. This approach has even led people back to the church. Lapsed Catholics sometimes, he added, come to this realization: This is my faith and my tradition, and I want to be buried from the Catholic Church someday. St. Joseph is a large and old parish. They average about a funeral a week, so the bereavement ministries keep busy. But, sometimes, they’re really busy. Deacon Mulvenon remembered one funeral that included visiting priests. Afterward, they commented on the large choir and the fantastic funeral dinner. Hardly anyone outside of the ministry knows how much work is involved. But making the food appear as if by magic is a testimony to the efficiency and work of the volunteers. When a funeral liturgy is planned at St. Joseph, the family is asked right off the bat if they want a funeral dinner. Usually they do. When that’s the case, the funeral ministry committee swings into action. The team consists of Carol Manley, Charlene Hartley, Lynne Jaime and their leader, Charlotte Garbee. The secret to the ministry’s success is planning, teamwork, division of labor and hard work. First, the four women get the ball rolling by calling and sending emails to volunteers drawn from a list of 100 names. Some volunteer to work the dinner, while others make and drop off salads. The number of volunteers who work at the actual dinner depends on the size of the expected crowd. Ditto for the number who will be asked to make and drop off salads. The dinners take place in the parish hall, under the church. A group of four people set up all the tables and chairs. All the desserts are donated by local businesses. Four individuals are responsible for picking up the donations and bringing them back to the church. Funeral dinners feature a semistandard menu, but allow for variety, too. The family is responsible for procuring meat and bread for the meal. Usually, they order it from a grocery store and have it delivered. The ministry provides a fruit tray and four side dishes. Generally, Manley makes the green beans, Garbee makes the baked beans, and Jaime makes the scalloped potatoes. All these are prepared in the parish hall’s kitchen. The ministry also provides beverages — coffee, tea, lemonade and water. The parish does charge families for the funeral dinner and accepts donations to the ministry, but no family unable to pay is turned away. When they can, the funeral dinner volunteers try to accommodate special requests. One family asked for candy dishes at all tables, and another wanted ice cream — because that was among the deceased’s final requests. Despite their best efforts, the funeral ministry sometimes runs into a glitch or two. At one funeral, they expected 200 people, but more than 300 showed up. “We accused Father Mike of putting out a sign that said ‘Free lunch here,’” laughed Garbee. This was one of the rare occasions when they ran out of food — except for the entree, which was meat. “I apologized to [a family member], but she said, ‘Don’t worry about it. The next time they’ll get in line earlier,’” said Garbee. Another time, a local grocery store’s deli was late sending an order of sandwiches. And one other time, the meat portion of the meal didn’t show up at all. That required drastic action. On a different occasion, another relative got on the phone and placed an extensive order to a nearby Go Chicken Go. “We’re very fortunate that we haven’t had more times like this,” said Manley. Funeral dinners are a great time for family members to grieve together, catch up and tell stories. It can almost be like a family reunion, albeit absent the guest of honor. And it doesn’t stop in the parish hall. If any food is left over, it’s boxed up and sent home with the family, so they can continue the gathering at a home. “It helps with the grieving process,” said Jaime. The funeral dinner volunteers generally begin just after 7 a.m. and finish with cleanup by the early afternoon. One time, however, a family just didn’t want to leave. Sometimes, families themselves want to bring in special food. One family brought in so much food that extra tables had to be set up. They even stayed to help clean up afterward. 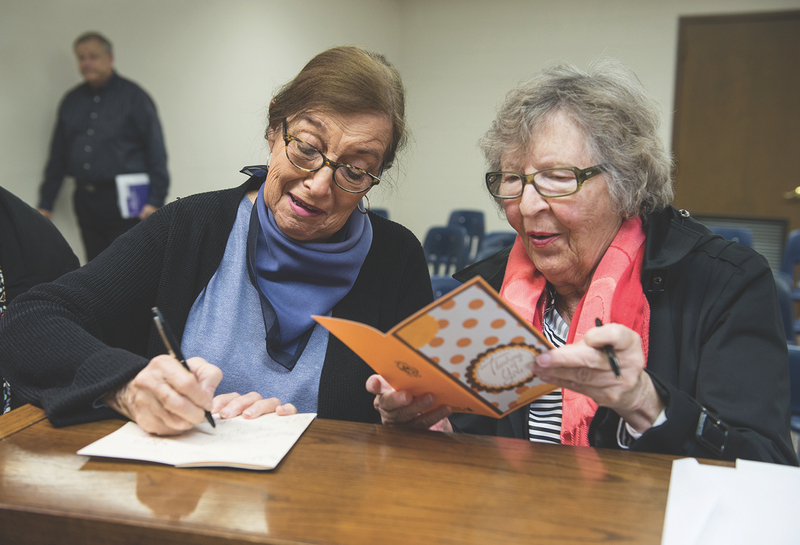 St. Joseph parishioner Nancy White, who attended the funeral dinner for her mother Wilma Hambelton in February, could speak for anyone who has experienced the funeral dinner ministry.